Cask Islay Vatting No. 1 (46.0%): Tomorrow is Thanksgiving, streets are already empty and Cambridge is cold and wet with the first snow flakes of winter falling slowly on the streets. I just came home and am very exciting about my long holiday weekend after a long and tiring month. I think I will go ahead and start the festivities with my sample of Cask Islay Vatting No.1 from A. D. Rattray portfolio. Although the new Cask Islay edition is now branded as a single malt whisky this early expression is a blended malt. The whiskies are sourced from Islay distilleries only but early press releases I could find online say that the majority of the whisky comes from one distillery. It is not caramel colored and also un-chill filtered. Color: Very pale straw, pinot grigio. 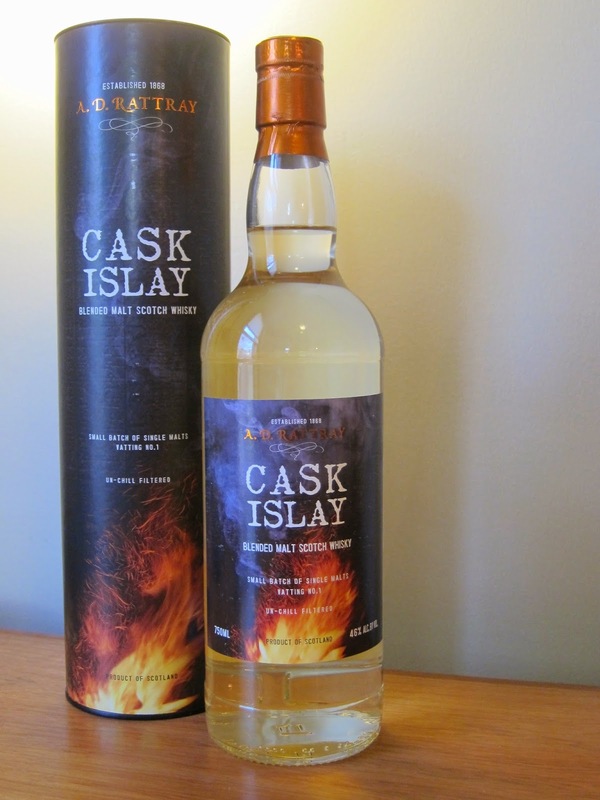 Nose: Young Islay whiskies: Bunsen burner, camp fire, burnt charcoal and wet beach sand. Lemon cookie dough, unripe anjou pears and vanilla. Adding a few drops of water works nicely: It separates all the layers and adds York patties and lemon honey Halls drops into the mix. Palate: Peat kick... Barbecue ash, wet hemp rope and very salty sea water. Barley cookies, pine honey and soot. Smoky quince jam sweetness. Imagine yourself scraping burnt and caramelized apple slices after a failed attempt of a skillet apple pie. I have to say adding water is trickier here on the palate than on the nose. A few more drops than necessary can make it flat and to be honest a touch boring. Finish: Medium long with sweet dusty soot and grilled banana peppers. Overall: That's again my kinda of a whisky. Young, ex-bourbon matured Laphr... ...Islay malt. Nothing complicated and/or fancy... Very young, honest and damn tasty... It would pair sooo good with a malty and sour flat Scottish ale. Even that thought was enough to make my night tonight... Thanks to my good friend Kent Barrett for the generous sample.